Dynamic chef & Managing Director Jacqueline Cottrell started deWintons, one of the top London Catering companies, from scratch over 15 years ago before joining forces with friend & business partner, James Symington. Not only does Jacqueline love the creativity of cooking & the challenge of devising tantalising menus but she also gets really excited by the presentation aspect of running a London catering company. Before setting up deWintons, Jacqueline trained at Leith’s School of Food and Wine – one of the best catering colleges for chefs – and worked for world class chef Anton Mosimann OBE, at his iconic restaurant The Belfry in London’s Belgravia which included event catering in London. James had his first introduction into the world of corporate catering when working as a kitchen porter in an Australian goldmine during his gap year. Upon his return to the UK he studied Engineering at Oxford Brookes University & whilst there he excelled in rowing and also learnt to fly solo with the RAF. James is also a highly experienced publican and has owned and run many successful gastro pubs in London including The Chelsea Ram. With his natural flair & ability to organise people it was inevitable he would one day run an events business. 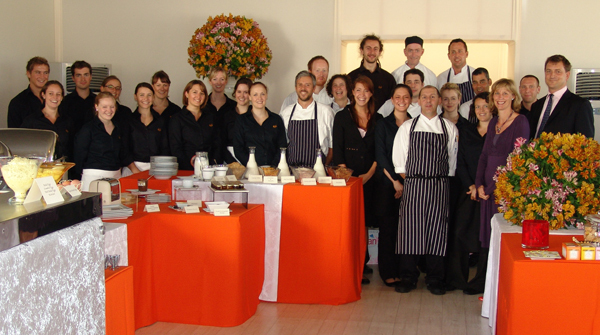 In 1997 James launched his first event catering company and over the following five years his client portfolio included BP, Strutt & Parker, Christie’s & UBS. James & Jacqueline then joined forces to form a dynamic partnership with their shared commitment to excellent event catering in London. James is a true ‘people person’ & believes in delivering outstanding customer service no matter how small or large the event. Clients adore his energy & passion! Cris trained at Westminster College and has nearly 20 years of event catering experience. Cris has flare, imagination and a passion for food which reflects within his menu design and day to day approach to Event Catering. Cris’s London venue knowledge is second to none and allows his expertise in menu design to be fully exploited to the clients benefit as he will taylor make the menu to fit both client and venue. He is the best problem solver in the business and can exceed most client expectations even when faced with a near impossible challenge. Organising & running corporate hospitality catering at Paris & Farnborough International airshows. Gemma started her career in venue management & marketing for a well known nightclub group before working for The Square Meal Venues & Events team. Since working in the event catering industry Gemma has worked for the likes of Damien Hirst, Jaeger, Matthew Williamson & has been involved in organising the NME Awards. Gemma has a passion for design and detail. Gemma loves to be creative and can spot a creased cloth or dirty glass from a mile away! Previously a member of The Spectator magazine events team, Charlotte has worked in the hospitality industry for over 5 years. Whilst studying History of Art at university she realised her passion for creative events and set up a voluntary arts association with a friend organising charity gigs and art exhibitions as well as directing and producing music videos. Charlotte also has a passion for cooking, regularly testing out recipes on family and friends running a monthly supper club with her best friend. Since working in the hospitality industry Charlotte has been fortunate to work at some of London’s most famous venues including the Royal Opera House, The Natural History Museum, Somerset House, and Hampton Court Palace.